Filled to the brim with memorable individual frames, but also coherent as a fully realized universe of its own and a visualization of the youthful energy of the film’s leads, the design team bring to the screen Wes Anderson’s unique vision with remarkable artistry and colorful pizzazz. The bayou-set world of Beasts is so integral to the narrative that it becomes difficult to distinguish the design as a separate entity a few minutes into the film, but that’s the greatest triumph of the designers. The low-key, nuts-and-bolts quality of the production enhances the authenticity of ‘The Bathtub’. The costumes and settings in Joe Wright’s visionary adaptation not only evoke mood and emotions, but very often they become the storyteller. That Wright manages to conceal the financial limitations of his film with such creative energy is in large part thanks to the contributions of his design team. Roger Deakins relishes the opportunity to flex his muscles in several showy sequences – the neon-lit tower in Shanghai, the lantern-clad casino – but his true mastery of lighting and his painterly instincts are also evident in Skyfall‘s more understated moments. Building on the same platform that shaped his indelible score for There Will Be Blood, Jonny Greenwood’s string arrangements are appropriately dissonant. The compositions are fragile and haunting, like a window into Freddie’s soul. A frighteningly authentic recreation of the East Asian Tsunami built with a seamless combination of computer animated imagery and mechanical crafts. Much more effectively than the screenplay, the effects team (along with the makeup artists and sound designers) put the audience in the shoes of the victims and convincingly convey their plight. So much has been made of the 65mm photography that this inclusion feels inevitable, but sometimes certain films live up to the hype and strike gold. The Master is one of those: lush, expansive and thematically flexible, this is an absolutely visionary work of photography, one that serves the narrative but also provides a healthy dose of frame-worthy images from start to finish. Quite an obvious choice, but a narrative that centers on the sound editing of a horror film demands expert sound design to be that chilling. This is extremely showy work, so much so that an audience completely oblivious to the aural structure in other films can pinpoint the strengths of Berberian‘s frightening sonic atmosphere, but its effect comes from a source entirely different from the cheap thrills of jump scares. The inclusion of the makeup process on screen is the only foundation on which Carax’s otherworldly vision is grounded. It provides the only consistent thread in the narrative, but it also paradoxically facilitates the suspension of disbelief, if only because of the artistry with which it is performed. There really is no Monsieur Oscar, only the characters he inhabits. 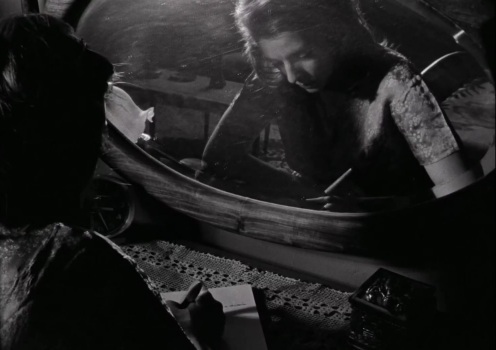 Tabu‘s entrancing, magical effect is in no small part indebted to the resplendent imagery that director Miguel Gomes and cinematographer Rui Pocas create. Their work reveals so much about characters by framing them in different ways in relation to one another (think of the brilliant sequence in the revolving restaurant) and through lighting and change of focus. It also changes the entire thematic and tonal scheme of the film by cleverly switching film gauges. It’s a work of flawless technical mastery that resonates on every level emotionally as well. Excellent picks throughout. Do you think Deakins has a chance come Oscar night? Hard to tell, I think Claudio Miranda might take it for Life of Pi. I think it's Miranda's to lose, too. CGI seems to be taking over the category, but if they go for pretty as they sometimes do, Skyfall is as showy as it gets.